Tokyo's very own police! Reliable and open 24/7! 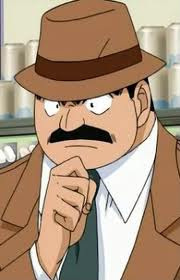 Juzo Megure (目暮 十三 Megure Juuzou) (also known as Joseph Meguire in the Funimation dub), commonly referred to as Inspector Megure, is a Police Inspector (Rank 6) in Division 1 of the Tokyo Metropolitan Police Department in the manga and anime Detective Conan. Shortly after Megure had come to the police force, he was involved in a case in which he would meet his future wife, Midori. As a result of the case, he has taken to wearing a hat in public in order to hide a scar which he gained and his own self-consciousness about how he came to his marriage. Megure was also a good friend of star detective story novelist Yusaku Kudo, and would in the past consult him about one case or another. On many such occasions, Yusaku would take his son Shinichi with him, who would pick up his father's investigative skills and eventually become a detective in his own right. 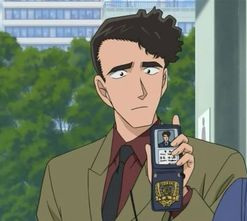 Wataru Takagi (高木 渉 Takagi Wataru) is a police sergeant and detective from the Tokyo Metropolitan Police District's Criminal Investigation First Division. Wataru Takagi is a newcomer to the Tokyo Police Criminal Investigations Division 1, having transferred after the bomber case about three years ago but by the time Shinichi Kudo first established his reputation as a detective, about two years ago. His mentor was a senior agent called Date, who died one year before the present timeline. 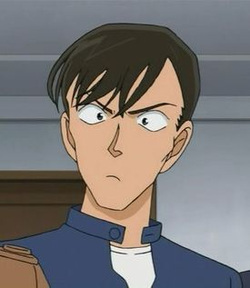 He first met Shinichi's alter ego Conan during the investigation of the murder of actress Isami Nagakura, accompanying Inspector Megure and helping to expose the trick with the identical rooms. Miwako Sato (佐藤 美和子 Satō Miwako), also known as Detective Saimone in the Funimation dub, is a police assistant inspector and detective in the manga and anime franchise Detective Conan. Eighteen years ago, when she was still at elementary school, Miwako lost her father, Masayoshi Sato, in a traffic accident as he was about to deliver a bank robber to the police - an event that marked her life. She eventually became a police officer on her own and now works alongside Inspector Megure, Ninzaburo Shiratori, Detective Chiba, and especially Wataru Takagi in the Tokyo police district. Chiba (千葉 ), commonly referred to as Detective Chiba (千葉刑事 Chiba-keiji), is a character in the manga and anime franchise Detective Conan. Chiba is a detective in the Tokyo district, and very often works alongside Inspector Megure and Wataru Takagi. His main duty appears to be to obtain information outside of the crime scenes. Sometimes, he will even go out and substitute as inspector when Megure is busy on another case. 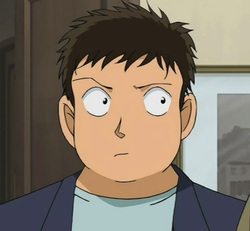 Initially, he was introduced as a minor role in the 4th Detective Conan Movie, as well as with a minor cameo in The Final Screening Murder Case. He then onwards takes more of a noticeable role throughout the series. Naeko Miike (三池 苗子 Miike Naeko) is a character in the anime and manga franchise Detective Conan. Naeko Miike is Chiba's childhood friend. They both attended Teitan Elementary together where they both joined the school broadcasting commitee (although Naeko only joined because Chiba did). She then moved after her sixth grade summer. She works in the traffic department of the Tokyo Metropolitan Police District directly under Yumi Miyamoto. Ninzaburo Shiratori (白鳥 任三郎 Shiratori Ninzaburō), also known as Nicholas Santos in the Funimation dub, is a character on the Detective Conan franchise. Yumi Miyamoto (宮本 由美 Miyamoto Yumi) is a character in the manga and anime franchise Detective Conan. Yumi is a traffic cop who mostly focuses on traffic accidents and hit-and-runs. She often runs into the Detective Boys and Conan when they are in the middle of solving a case, and has helped them numerous times in solving cases and catching criminals.